Evidence continues to mount that a young woman’s life experiences—whether famine, PTSD or recreational drug or alcohol use—can affect a baby she delivers years later. These findings have major implications for understanding why addiction runs in families, which has long been attributed to socioeconomic factors or considered a byproduct of the psychological harm children suffer when they grow up in a household where there’s substance abuse. Elizabeth M. Byrnes, head of the section of neuroscience and reproductive biology at Cummings School of Veterinary Medicine, has been researching these issues for a decade, concluding that opioid use in adolescence may affect the health of the next generation and beyond. In her groundbreaking paper published in the journal Psychopharmacology in 2005, Byrnes discovered that the female offspring of rats exposed to morphine during adolescent development were more anxious than their drug-free counterparts, and both male and female offspring had an increased sensitivity to the drug. Since that original experiment, she’s also documented opioids’ impact on mothers’ ability to care for their young. She has seen similar effects in the third generation, as well. 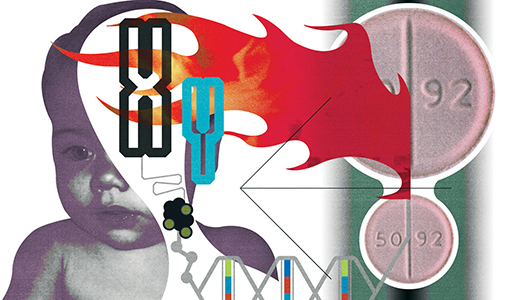 “What we know is that [offspring] respond differently [to drugs their mothers were exposed to]—even though they themselves were never exposed to these drugs,” Byrnes says. The mothers’ opiate exposure—long before pregnancy—had altered the reward system in their daughters’ brains. 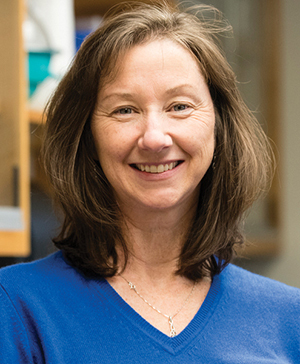 In her most recent study, published online in December in the journal Neuropharmacology, Byrnes exposed adolescent female rats to opioids and then studied their offspring. When she dosed some of the daughters with the drugs, they responded to lower doses than animals born to mothers that were drug-free. That indicates that the mothers’ opiate exposure—long before pregnancy—had altered the reward system in their daughters’ brains, Byrnes says. Indeed, when her research team looked at the daughters’ siblings that were never given drugs, they saw differences in the parts of the brain—specifically in receptors for certain neurotransmitters—that correspond to the reward system. “So even at baseline, these animals start at a different set point,” she says. A metaphor for inherited traits is that your genome serves as the instruction manual that tells your cells how to build you. You pass an exact copy of this instruction manual on to your offspring. But epigenetics has made that metaphor as obsolete as, well, paper instruction manuals. Our genomes, it seems, are more like Wikipedia, subject to continuous, on-the-fly editing by any number of contributors. While the genetic code itself remains intact and unchanged, environmental factors can physically alter DNA, changing the way genes are expressed. These alterations, research increasingly suggests, can be passed down through generations. Other researchers have seen results much like Byrnes’ in studies involving depression, stress, anxiety and diet. And lest this seem like an unfair burden on mothers, there’s evidence that fathers, too, can pass epigenetic changes to their offspring. Even though some scientists remain skeptical, by 2009, “epigenetics had become a thing,” Byrnes notes with a laugh. “Sometimes in science you get a good confluence of changes.” Now that the scientific community is comfortable that the phenomenon is real, Byrnes and other researchers are working on documenting those epigenetic changes and at what point they emerge. If the consequences of drug use before pregnancy remain unclear, there’s no question that drug use during pregnancy has devastating effects. About half of babies born to mothers hooked on opiates suffer from neonatal abstinence syndrome, basically severe drug withdrawal. These babies stay in the hospital for four to six weeks after birth while they are treated with less-toxic opiates and eventually weaned off the drugs. While they detox, the infants vomit, spike fevers and suffer from seizures, tremors and muscle tension. They wail uncontrollably at an unnaturally high pitch. Five out of every 1,000 newborns are addicted to opiods. Babies are the littlest victims of an opioid-addiction epidemic sweeping the country. Forty-six Americans died from opioid painkiller overdoses every day in 2015, according to the American Society of Addiction Medicine. The number of prescription opioid poisonings spiked by a whopping 91 percent between 1999 and 2002, when oxycodone hit the market and was promoted (incorrectly) as nonaddictive. When people can no longer obtain expensive prescription pain pills, about three quarters of those hooked on the drugs will graduate to heroin. Byrnes is collaborating with Davis at Tufts Medical Center to tackle neonatal abstinence syndrome. Doctors rarely encounter an opiated-addicted mother- to-be who isn’t on multiple other drugs, whether she is taking methadone to kick the habit, using prescription antidepressants or abusing more than one substance, says Byrnes. But little is known about how these drugs work in concert on unborn babies, and even less is known about how best to safeguard them from harm. Byrnes hopes to use her animal models to determine the best way to treat human newborns. Byrnes is less concerned with the potential generational epigenetic effects than addressing the immediate addiction crisis many families are struggling with today. She’s active with the Decisions at Every Turn Coalition, a community intervention program in Ashland, Massachusetts, where she lives, that taps into schools, families, police, town officials, liquor stores and other small businesses in an effort to curb youth substance abuse. “What we probably know is the best thing to do is prevent,” she says, “but if you can’t prevent, [then] delay” teenagers’ first experiences with alcohol, tobacco and drugs. The group focuses its efforts on middle school kids, and addresses issues that are risk factors for future substance abuse, including bullying, learning disabilities, depression and anxiety. “Substance abuse is really a symptom of a lot of other issues,” says Byrnes. Jacqueline Mitchell, a senior science writer at Tufts, can be reached at jacqueline.mitchell@tufts.edu.